Libyan rebel forces push closer to Moammar Gadhafi's hometown of Sirte, a key government stronghold that lies between the rebel-held city of Benghazi and the capital Tripoli. Libyan rebel forces pushed closer Monday to Moammar Gadhafi's hometown of Sirte, a key government stronghold that lies between the rebel-held city of Benghazi and Tripoli, Libya's capital. The lightning rebel advance of the past few days, backed by international coalition airstrikes, has restored to the opposition all the territory lost over the past week and brought rebel forces to within 100 kilometres of Sirte, the bastion of Gadhafi's power in the centre of the country. 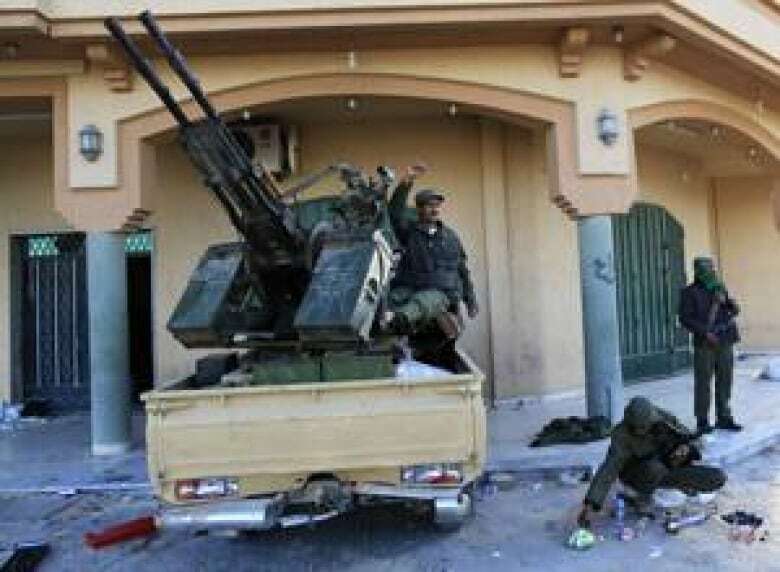 The rebel advance came to a stop, however, after encountering government fire along the exposed highway and the heavily mined approach to Sirte. "Gadhafi is not going to give up Sirte easily because straightaway after Sirte is Misrata, and after that it's straight to Gadhafi's house [in Tripoli]," said Gamal Mughrabi, a 46-year-old rebel fighter. "So Sirte is the last line of defence." Canadian CF-18s flattened an ammunition depot and have co-ordinated other coalition air raids over Libya involving up to 20 warplanes, the military confirmed Monday. A reinforced bunker, 92 kilometres south of the battered city of Misrata, was hit with 225-kilogram, laser-guided bombs. It was the second ammunition dump taken out by the Canadian air contingent in a week. Four CF-18 Hornet fighters from 425 Squadron out of Bagotville, Que., took part in the Sunday raid. There were no reports of casualties in the surrounding area, said Lt.-Col. Chris Lemay, an Ottawa spokesman for the overseas command. One of two CP-140 maritime surveillance planes, which were dispatched last week by the Harper government to enforce the UN arms embargo against Moammar Gadhafi's regime, flew its first long-range patrol mission without incident on Monday. Soldiers from a brigade led by Gadhafi's son al-Saadi and allied militiamen moved to defensive positions on the city's outskirts, and Sirte was hit by airstrikes Sunday night and Monday morning, witnesses said. NATO says its airstrikes are designed to protect civilians and not to aid rebel ground operations, but it's apparent the outgunned opposition is benefiting from the air attacks to advance on the ground. "Clearly [the rebels are] achieving a benefit from the actions that we're taking," U.S. Vice-Admiral William Gortney, staff director for the Joint Chiefs of Staff, said Monday in Washington, D.C.
Gortney said that over the weekend U.S. air force A-10 Thunderbolt aircraft, designed to provide battlefield support to friendly ground forces, flew attack missions for the first time in the conflict. Also joining the battle, he said, were air force AC-130 gunships, a low-flying aircraft armed with a 105mm howitzer and a 40mm cannon. The airstrikes may have helped the rebels, Gortney said, but "the opposition is not well organized, and it's not a very robust organization, that's obvious. So any gain that they make is tenuous based on that." U.S. President Barack Obama is scheduled to give an update on the situation in Libya on Monday evening in a televised speech. The latest push comes a day after NATO said it would take command of all military operations in Libya. The UN Security Council authorized countries to take all necessary measures to protect civilians in Libya, but some critics have said the military campaign goes beyond what was authorized. On Monday, Russian Foreign Minister Sergey Lavrov said the international air campaign breached the UN resolution and amounted to international interference in what he called Libya's civil war. However, NATO Secretary General Anders Fogh Rasmussen told the BBC that NATO was "impartial" and sought only to protect civilians. "We are there to protect civilians within the framework of the UN mandate — no more, no less," he said. Asked where NATO drew the line between protecting the civilians and aiding rebels, the Canadian commander said his mission was clear: "Our goal is to protect and help the civilians and population centres under the threat of attack," he said. Rasmussen said that he hoped to see a ceasefire and a "political and peaceful solution" as soon as possible, but would not comment on how long that process might take. There were conflicting reports about how close the rebels were to Sirte, but Gen. Hamdi Hassi, a rebel commander in the small town of Bin Jawwad, said fighting was occurring just outside the small hamlet of Nawfaliyah, 100 kilometres from Gadhafi's birthplace. "Sirte will not be easy to take," Hassi said. "Now, because of NATO strikes on [the government's] heavy weapons, we're almost fighting with the same weapons, only we have Grad rockets now and they don't." Hassi added that the current rebel strategy was to combine military assault with an attempt to win over some of the local tribes loyal to Gadhafi overto theirside. "There's Gadhafi and then there's circles around him of supporters; each circle is slowly peeling off and disappearing," Hassi said. "If they rise up, it would make our job easier." In a joint statement Monday, British Prime Minister David Cameron and French President Nicolas Sarkozy said Gadhafi loyalists should abandon their leader and side with the rebel cause. "We call on all his followers to leave him before it is too late," the leaders said. "We call on all Libyans who believe that Gadhafi is leading Libya into a disaster to take the initiative now to organize a transition process." Cameron and Sarkozy repeated their call on Gadhafi to step down and said the opposition's Interim National Transitional Council should help begin a transition to democracy. The Libyan state news agency reported there had been airstrikes against the southern town of Sabha, which remains strongly loyal to Gadhafi and is a major transit point for ethnic Tuareg fighters from Mali and Niger fighting for the government. There were also reports that Libyan officials had made a unilateral call for a ceasefire in the embattled city of Misrata, the only place in rebel hands in the country's west, CBC'sNahlah Ayed said. "We have heard these calls for a ceasefire before," Ayed said from the eastern city of Benghazi, noting that previous calls for ceasefires have been ignored. On Monday, Libyan officials took foreign journalists on a tour of Misrata's outskirts but not into the centre, indicating government control did not extend far. Explosions and gunfire echoed through empty streets lined with burned out tanks and bullet-scarred buildings. Turkey has confirmed that it has been talking with the government and the opposition, even as rebel forces advanced on Sirte. "We are one of the very few countries that are speaking to both sides," Foreign Ministry spokesman Selcuk Unal said, without confirming whether Turkey had offered to act as mediator. Turkish Prime Minister Recep Tayyip Erdogan told reporters his country will take over the running of the airport in Benghazi to facilitate the transport of humanitarian aid to Libya, but did not say when. Meanwhile, the tiny Persian Gulf state of Qatar has formally recognized the rebels as the legitimate representatives of the country and promised to help them sell their crude oil on the international market. Qatar has been well ahead of other Arab countries in embracing the rebels and is also participating in the UN-mandated no-fly zone over Libya.